The south-west of Western Australia experienced a wetter and cooler spring than normal but in the first week of December, suddenly summer was upon us with a few days with temperatures in the high 30s. This was the cue for the Stephanotis seedpods which I had laid on the ground about a year ago to burst open. 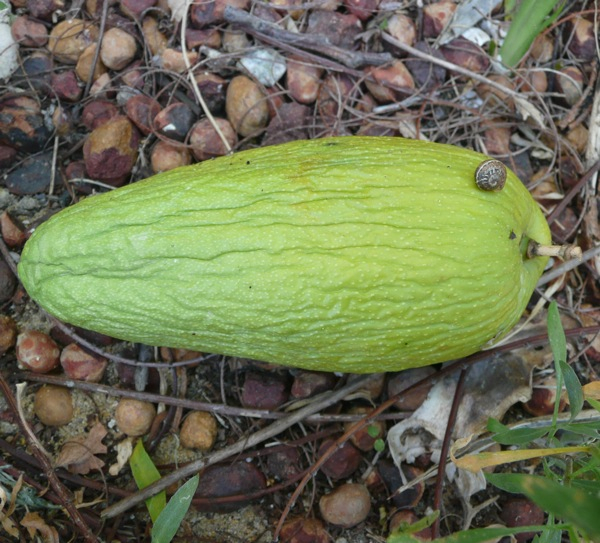 I normally pick off the pods when they’re about the size of a cherry so that the plants direct their energy into flowering rather than into seed production but occasionally I will discover a pod about the size of an avocado. This year I placed 4 large pods on the ground in a dryish spot amongst some succulents. 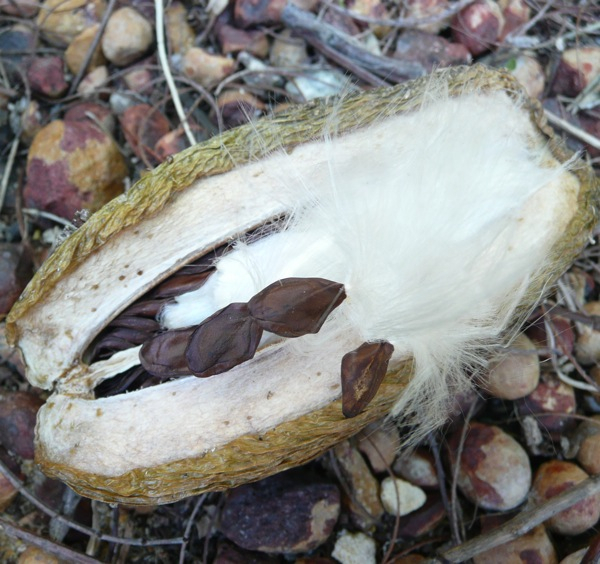 There they lay for many months until the hot weather caused them to split open, revealing dozens of tightly-packed brown seeds, each with a head of silky white hair. 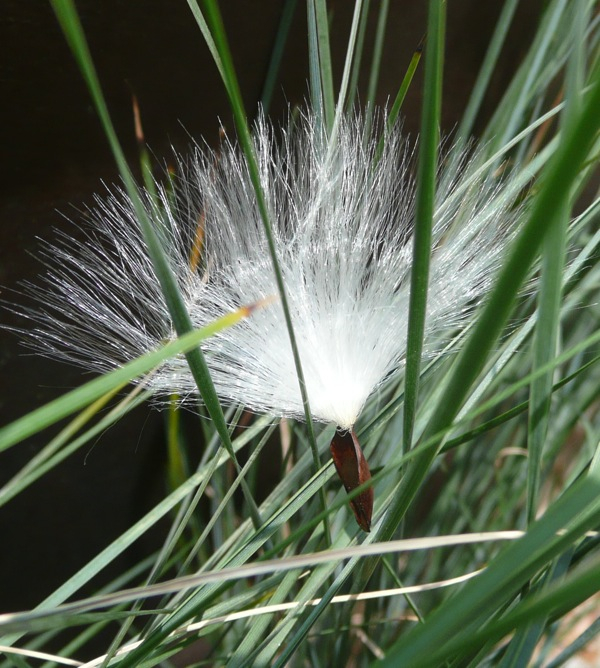 The fluffy hairs allow the seeds to drift in the breeze and parachute into what is hopefully a good place to germinate. 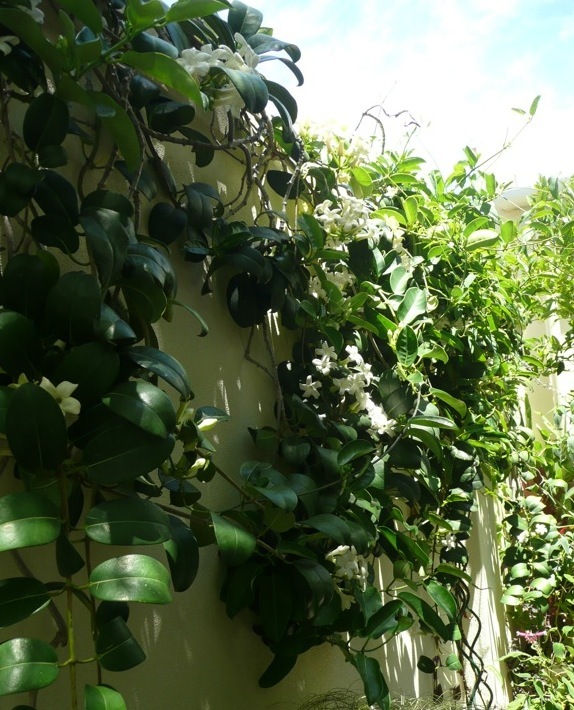 Stephanotis aren’t that common in Perth but when I saw a lovely one growing on a north-facing wall on a house in my street, I decided that I’d like to try one. Mine was planted in early 2001 but it didn’t flower until the hot February weather of 2006. Now it flowers for at least 8 months of the year, from November to May. It’s famous for its delicious perfume in the morning and evening. The white flowers have a waxy sheen to them and are a little bit fleshy. The dark green foliage is also a bit leathery or fleshy and it can get sunburnt in the heat of the day in Perth. My plant is growing on west-facing wall but it’s protected from the hot afternoon sun by the shade of the house and also a poinciana tree in summer. This ensures that it’s warm but it doesn’t get sunburnt. It’s in a raised bed with enriched soil, as the soil is naturally a limestone-sand, which it wouldn’t like. The enriched soil also keeps the roots cooler. I’ve trained mine up the wall but it has a natural propensity to cascade back down. This makes it popular for bridal bouquets as it trails down, with its beautiful white perfumed flowers and dark green leaves. Some of its common names refer to either bridal or Madagascar jasmine, although in Perth we don’t seem to use the common names. It’s a native of Asia, Africa and Madagascar. Mine doesn’t seem to get any diseases, possibly because of the dry climate here and also because it’s breezy as well. I’ve never tried to germinate any of the seeds but, from what I’ve read, it isn’t very difficult, as long as the seeds are kept moist and have only a very light layer of soil on them. It will be interesting to see if any of the seeds germinate naturally, although where they’re laying is probably not an ideal situation, with unimproved soil and gravel mulch……..
It’s now the second week of summer (the second week of December) and again we’ve had unusual weather with heavy rain, so many of the seeds that had split open are just lying there in a big, soggy mess. So unless we get some drier weather and they’re able to dry out and blow around, I think they might just rot away, and I have noticed a few snails enjoying the feast. I’ve never seen snails eat the flowers or leaves but they do seem to like the seed pods. As long as the plants aren’t exposed to the hot summer sun, they’re quite easy to grow. I feed mine with slow-release fertiliser and I have been giving it worm juice, which seems to have increased flowering. They’re not very vigorous so I hardly ever have to do any pruning, although I do pinch out the tips to encourage the plant to bush up. 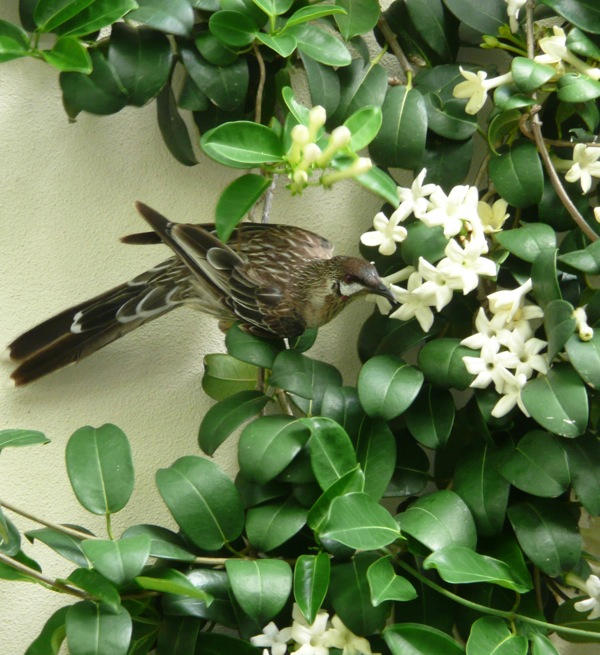 Honey-eaters and red wattle birds regularly visit my climber, often putting their beaks right down into the flower. I assume they also keep down any other little pests. 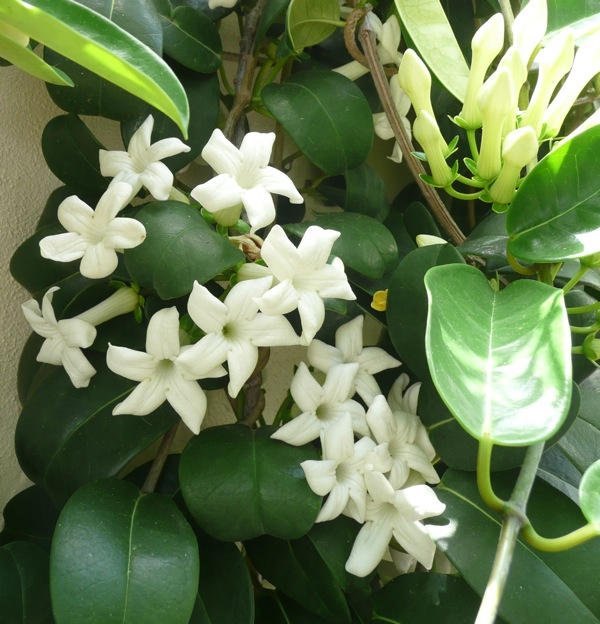 Stephanotis grow well in a pot in enriched soil, and in cooler climates they can even be grown indoors. I think they’re worth growing just for the fantastic perfume, but the white flowers are also very attractive, so I’d encourage anyone to try and grow a Stephanotis floribunda.